The Gallant Stonewallers. 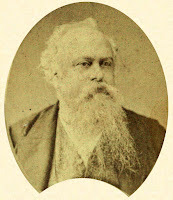 — We have received from Mr W. Gibbs, photographic artist, of Wellington, a cabinet sized card containing portraits of "The Gallant Stonewallers on the Representation Bill." 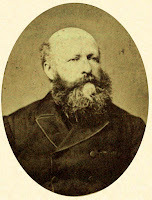 The card is headed "Nelson to be wiped out," and below this are the portraits of Messrs Shephard, member for Waimei; Levestam, City of Nelson; Gibbs, Collingwood; Reeves, Grey Valley; Seddon, Hokitika; Bastings, Wakaia; and Pitt, Nelson, the latter being placed in the centre. Below the photographs, which are admirable ones, is written "who laid the foundation of the Stone Wall August, 1881. We understand that copies of this souvenir of the present momentous struggle are to be obtained of the booksellers, and we may expect that there will be a considerable run upon them. 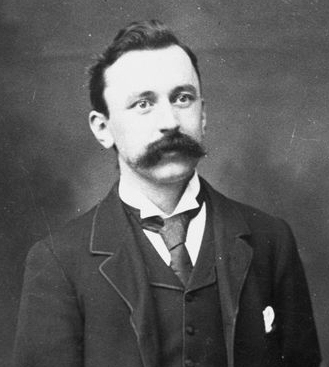 Mr W. Bricknell Gibbs, photographer, Lambton Quay, Wellington, has brought out a capital photographic picture of the seven members of the House of Representatives who formed the original stonewall party on the Representation Bill— viz-, Messrs. Pitt, Shephard, Gibbs, Levestam, Seddon, Reeves and Bastings. 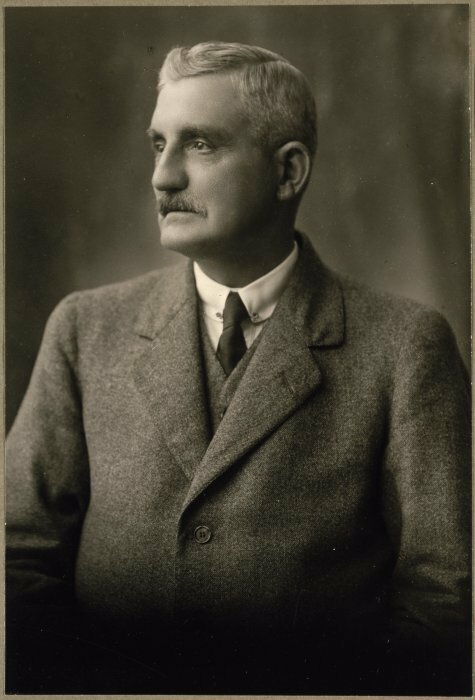 Mr W. Brickell Gibbs, photographer, has produced a very neat card with the photographs of the seven members who commenced the stonewalling of the Representation Bill. They should command a ready sale at Nelson, where public feeling is reported to be running high on the subject. The members represented are Messrs Shephard, Gibbs, Levestam, Pitt, Reeves, Seddon, and Bastings. 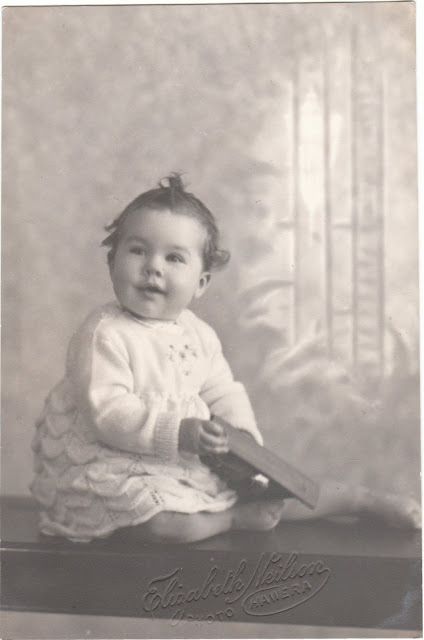 born 8 July 1878 son of Mary Janet Arnold [or Jannett] only daughter of John Arnold of Foxhill. (Press Association Telegram) Westport, February 9. 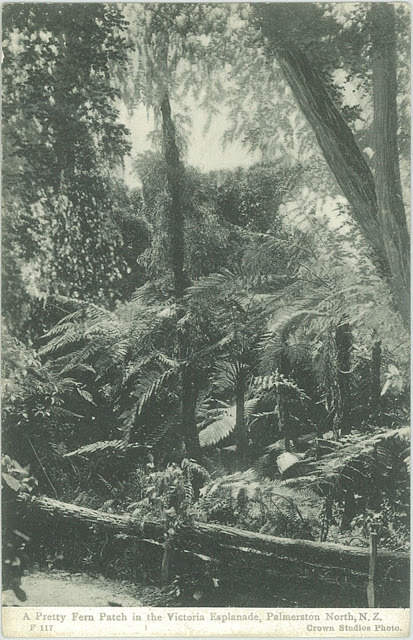 The body of a man was found by prospectors outside an old hut at the Britannia mine, Waimangaroa, to-day, and brought to town. 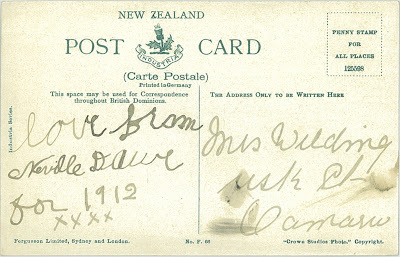 It is understood to be that of George [sic] Bernard Arnold, of Waipukurau, a returned soldier, who was last seen over a fortnight ago going up to the mine, at which no work has been going on far some time. A note was left stating that he was in agony from ptomaine poisoning; after eating meat from a tin. He could stand the pain no longer, and was taking poison. Our Takaka correspondent writes : — A cave of exceptional size and beauty has been discovered by a party of lads who were out on a shooting expedition. 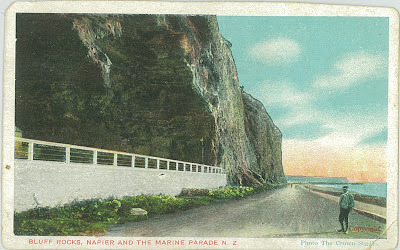 If the reports of those who have visited this addition to the many interesting spots in Takaka can be relied upon, the cave is a very large and beautiful one. It is said to be so situated that at one time of day the sun shipes well into the first cavity, adding the most beautiful colourings and shades to the already magnificent stalactites. The first chamber is a very large one, the ceilings being lofty; but after proceeding back some 70 feet into tho hill another door or entrance admits the visitor to a much larger and still more wonderful apartment, which is said to extend a further distance of three chains, the ceilings being also lofty. It is said there are dray loads of round pebbles, varying in size from marbles to eggs, deposited in one section of the cave, caused by the action of water in some remote ages. 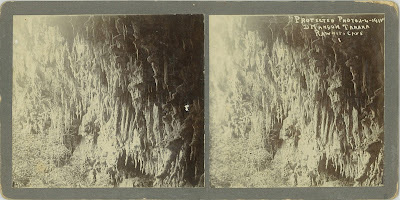 The new find is situated at the back of the well-known Harwood's cave, and at present is rather difficult of access, but a side-cutting can be easily made which will make the cave easily approached. Mr Harwood, who has charge of the former cave, has visited the stranger and assures me that the beauties of the new one are not exaggerated. He strongly advised immediate action being taken to have it protected from vandalism. I believe the land on which the cave is situated is owned by Mr Darcy Manson, who has advertised warning visitors not to trespass without his permission. 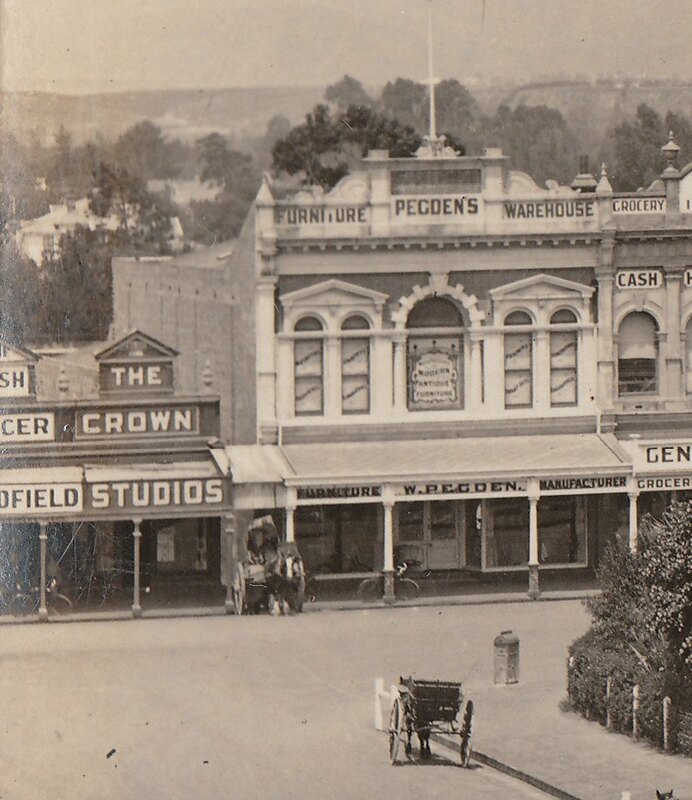 The Crown Studio, Fitzherbert avenue, Palmerston North. 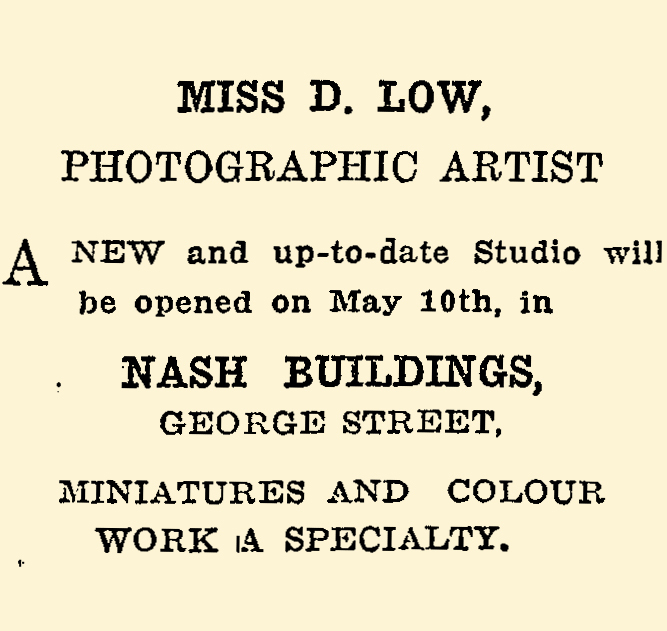 Miss D. Low, the photographic artist of George street, Palmerston North, has purchased the Crown Studios in Fitzherbert avenue, for many years conducted by the late Mr. E. R. Whalley. 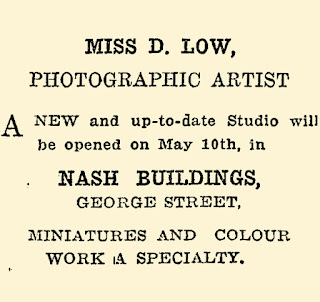 Miss Low is regarded as an expert in all branches of photographic work, and the Crown Studio, with its extensive plant, has been brought right up to date, and the public will appreciate the good work of this young artist and her staff as displayed in the vestibule of the Crown Studios at the present time. Miss Low has a great reputation for wedding groups and children's photographs. Reliability and prompt service is the motto of the Crown Studios. The death has occurred of Mr. David W. Low, of Palmerston North, who is remembered chiefly because of his educational activities, a six years' association with the City Council, and his devotion to the work of St. Andrew's Presbyterian Church. He was born in Aberdeen, Scotland, and came to New Zealand at the age of four years. 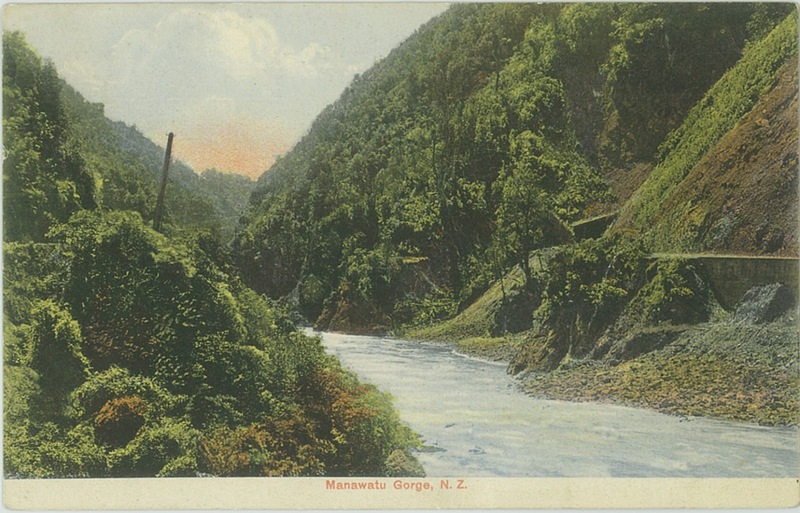 He was educated at Wanganui, and his first headmastership was at Fordell in 1896. 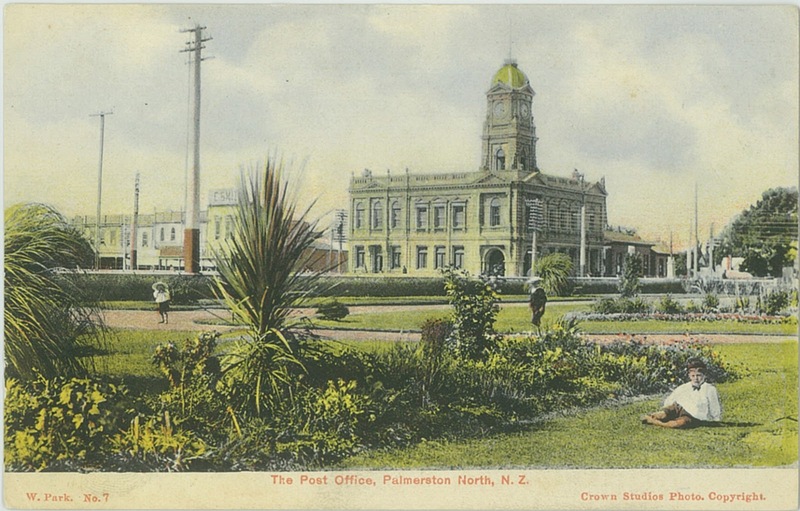 He went to Sanson in 1893, Waverley in 1898, and the College Street School, Palmerston North, in 1904, and held that position until he retired in 1924. 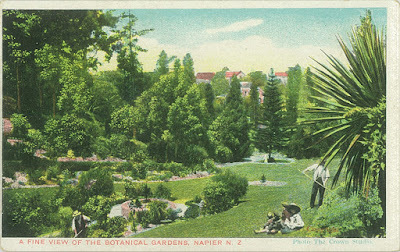 He was later a member of the Wanganui Education Board, and in 1923 president of the New Zealand Educational Institute. 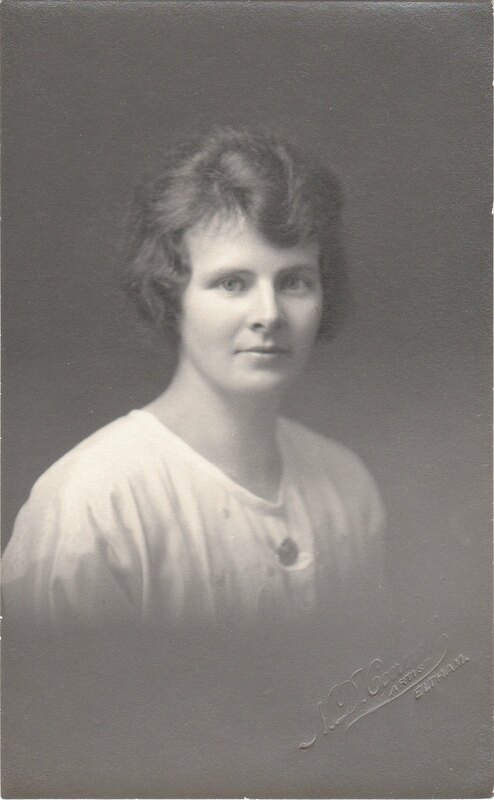 He served on the City Council from 1925 to 1931 and for 25 years was session clerk at St. Andrew's Church. He is survived by his widow, three sons, and two daughters. One son [Eric Leslie Low] was killed in 1914-18 in France. 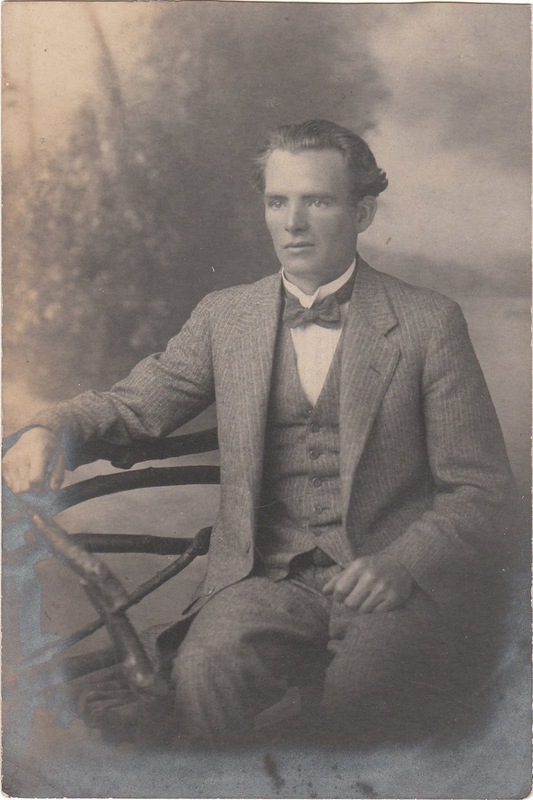 In 1895 David Walker Low was Registrar of Marriages, Births, and Deaths, and Vaccination Inspector for the district of Sanson. Ernest Richard Whalley, born circa 1863 Liverpool, Lancashire, England, reg. West Derby vol. 8b page 352, son of Naomi Whitehead and John Whalley (pawnbroker), bapt 5 April 1863, Grove Street Chapel, Liverpool, , arrived New Zealand on the "R.M.S. Aorangi" departed London 12 October 1893, arrived Wellington 29 November 1893 via Plymouth, Capetown and Hobart, died 14 March 1929 at the Public Hospital, Palmerston North, aged 66 years, buried 16 March 1929, Terrace End Cemetery, Palmerston North, block 019, plot 041. The Fire.— Mr E. Whalley has forwarded a couple of large photographs of the scene of the late fire at the Commercial Hotel, which are capital pictures of the destructive effects of the devouring element. Mr Whalley, of the Crown Studio, has just received a charming series of views of the Rotorua district. The series includes some excellent photos of the pink and white terraces, while some enlargements of the same are quite the best we have seen for some time. 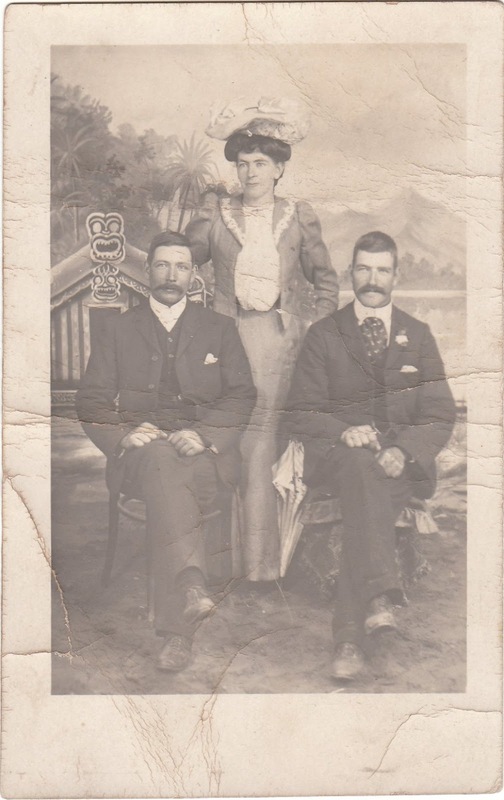 Other photos deal with Maori life and the springs and geysers in the Hot Lake district. The views would form the most acceptable Christmas present for anyone. 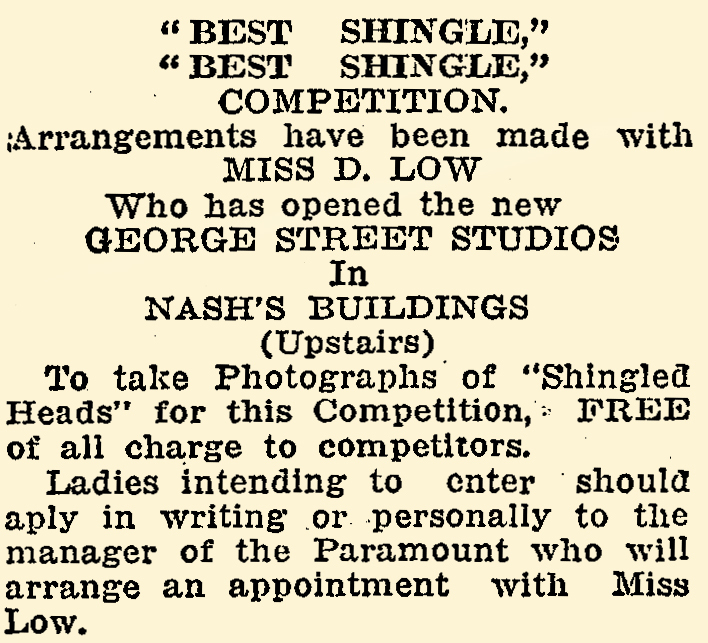 Messrs Whalley and Co., the up-to-date photographers, have purchased the negatives of the late Thos. Attwood [who died 15 April 1904 at Palmerston North], and extra copies can be obtained at the Crown Studios. Messrs G. H. Bennett and Co. have forwarded us a beautiful series of pictorial postcards dealing with Palmerston North. 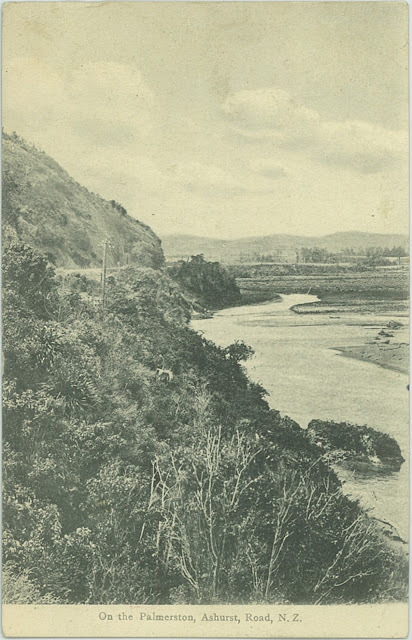 The views include tree ferns, Victoria Esplanade, railway station, Manawatu Gorge and traffic bridge, Fitzherbert bridge from both sides, Palmerston Hospital, and four fine views of the Square. The photos were taken by Messrs Whalley and Co. and the blocks printed in England, in a remarkably attractive manner. 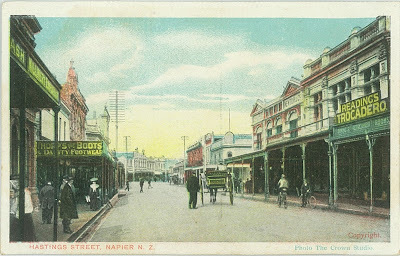 As a means of advertising our town and showing its attractions to residents abroad, these cards will be found excellent. 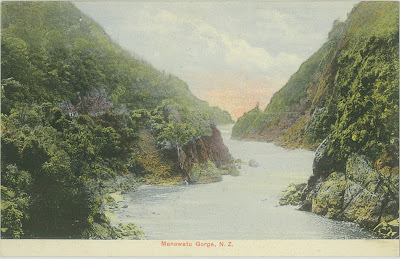 From Messrs Whalley and Co. comes a souvenir of the Manawatu Gorge. It is the finest thing of its kind ever seen in New Zealand, printed on good paper by the new collatype process. A limited number are to be placed on the local market. Messrs Whalley and Co., proprieters of the Crown Studios, have forwarded us a handsome souvenir of the Manawatu Gorge in the form of a collection of views of this noted beauty spot. The pictures were executed in England from photographs taken by Messrs Whalley and Co., and each copy is neatly bound. A finer set of views has not been obtainable locally and Messrs Whalley and Co. should experience a keen demand for copies. Mr W. H. Whalley, of the Crown Studio, Palmerston North, has been busily engaged to-day taking views of various parts of the town [Hastings], for the purpose of issuing a set of post cards. He will also issue a panoramic view of the town, as taken from the top of the Grand hotel. The illustrations in this week's Canterbury Times are chiefly devoted to views of the recent floral fete in Palmerston, and of the Hastings Band Contest. 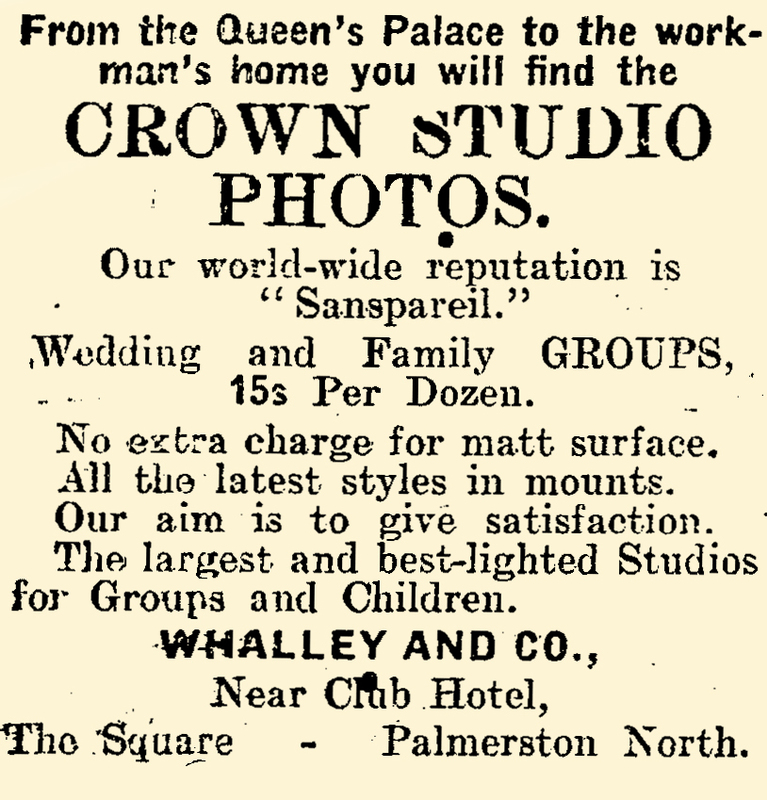 The bulk of the pictures are reproduced from photos taken by Messrs Whalley and Co., of the Crown Studio. The clearness of the reproductions demonstrate the high-class of work turned at the Crown Studio. 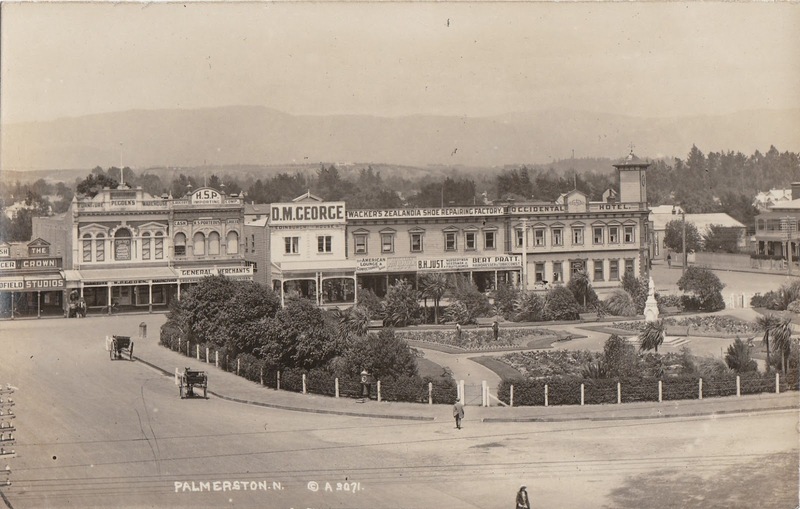 Palmerston North showing the Crown Studios to the far left next to Pegden's Furniture Warehouse. Messrs Whalley and Co., of the Crown Studios, Palmerston North, have purchased the well-known and old-established business formerly carried on by Messrs Bell Bros., of Broadway, Marton. 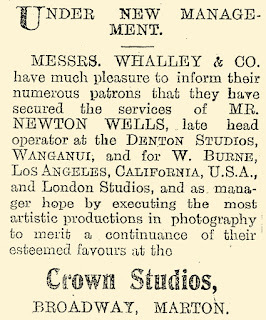 Messrs Whalley and Co. have, by the quality of their work and the energy displayed in conducting their business, built up a reputation in this district, and Rangitikei residents are assured that should they favour the Crown Studios with their patronage they will receive every attention. It is the aim of Messrs Whalley and Co. to give satisfaction to patrons, and their experience should be a sufficient guarantee in this connection. 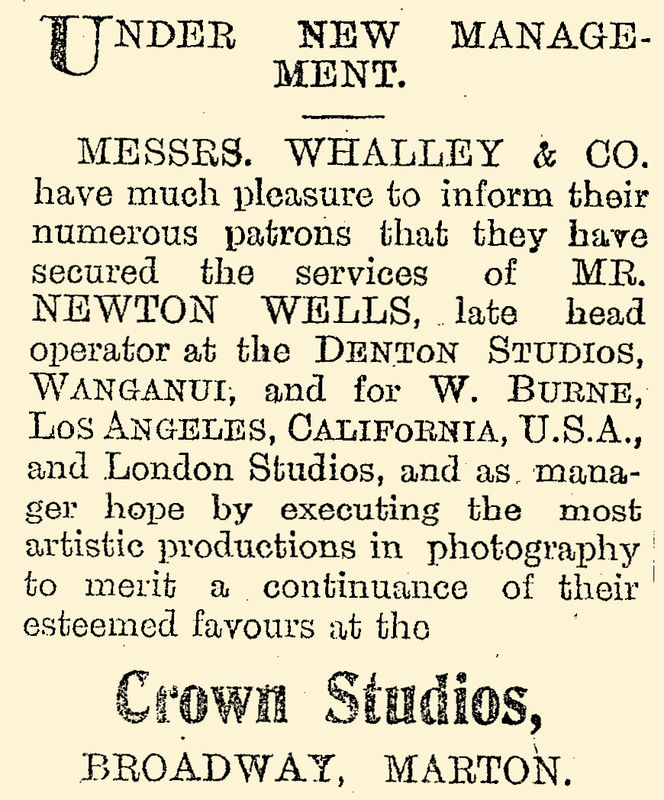 It is Messrs Whalley and Co.'s intention to conduct their Marton business under the name of the Crown Studios, and it will be carried on in conjunction with their Palmerston North business. We have visited Messrs Whalley and Co. when last in Palmerston, and were shown through their extensive premises and found them busy in all the different departments. 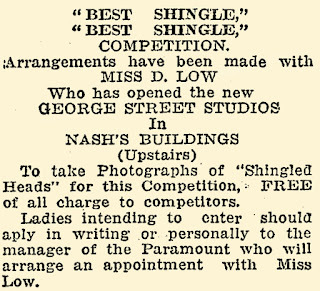 They have just installed a very fine Century studio camera and large (Ross and Co., of London), anastigmatic portrait lens, to cope with their increasing business, and have also a special large and long bellows camera with a very expensive set of lenses for copying or enlarging photos, and in most cases the copied photo is better than the original. We were shown some excellent specimens of the work which looked very fine and were real works of art. The large studios are furnished with a fine set of backgrounds, both exterior and interior, and one very fine cathedral background (made especially to their order) for wedding groups, also some very pretty fancy chairs and all other accessories with which to execute all the different kinds of up-to-date photography. They have a very fine range of new mounts which we were informed are the pick of the English, American and Continental manufacturers, and with such a fine selection to choose from we are sure that they will be able to more than satisfy the most fastidious taste. They are giving their Foxton friends a special inducement to visit the Crown Studios during show week, by presenting every patron for one dozen cabinet photos with a beautiful enlargement free of charge, and we feel confident that our readers cannot do better than avail themselves of this grand opportunity, and we are confident that they will receive civility, attention and every satisfaction from Messrs Whalley and Co., who are always anxious to please all those who patronise them. 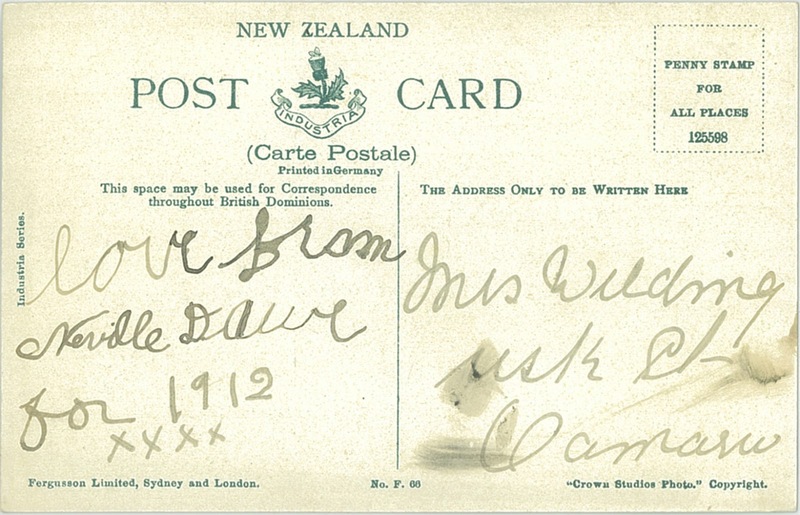 "Love from Neville Dawe for 1912"
to Mrs Wilding, Usk St, Oamaru. Photography is more than photography — it is an Art. To portray the soul of the sitter and not the mere exterior requires skill, and is only possible by an artist. 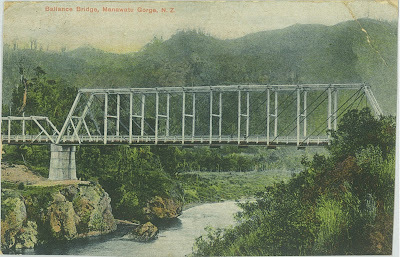 Pictures of this description can be obtained at the “CROWN STUDIOS,” Marton (Whalley and Co.) where the personal touch of the artist is shown throughout, and besides skill the studio is necessarily equipped with the most modern lenses, and the backgrounds, which are just imported, are painted by America’s most famous scenic artists. 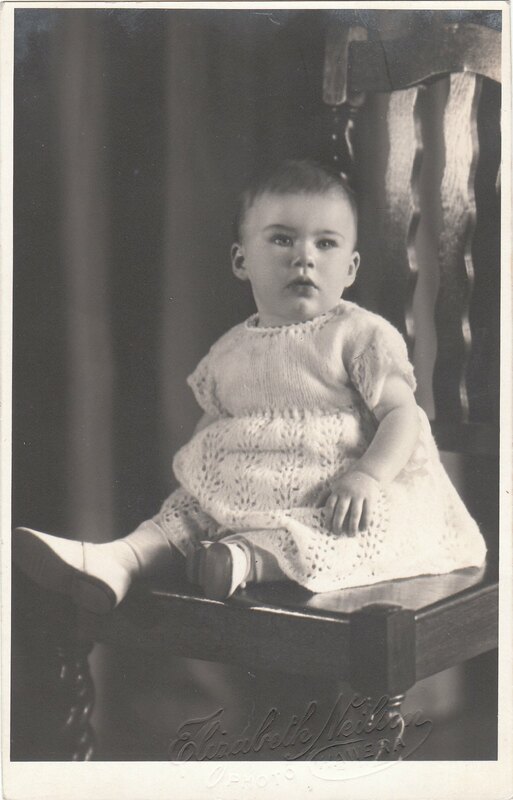 Our manager, Mr Newton Wells, by his great experience of photography gained in America and abroad is second to none, and his pictures of ladies and children, etc., are delightful for their beauty and technique. In order to prepare for the busy season Messrs E. R. Whalley and Co. are having the Crown Studios altered and completely renovated. These will not only add to the attractiveness of the studios, but will provide increased facilities for dealing with an increasing business. These improvements will he completed by Saturday evening, and on Monday Messrs Whalley and Co. will be ready to receive patrons. 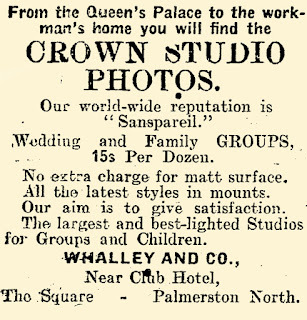 The Crown Studios (Whalley and Co.), the Square, announce that their new studios are now ready, and that they are prepared to execute orders of all descriptions. Christmas photos will be a speciality. The death occurred at Palmerston North last evening of Mr Ernest R. Whalley, who for the past thirty years had been in business there as a photographer. He was a devoted member of All Saints’ Anglican Church. 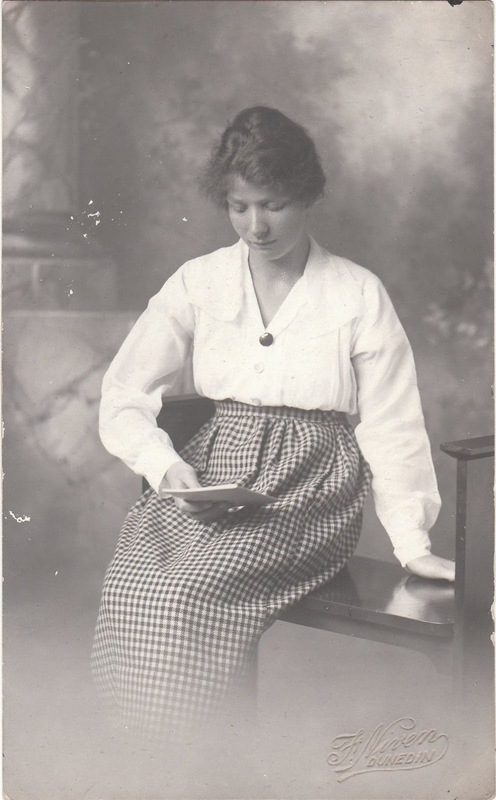 Miss Naomi Whalley, the well-known singer, is a niece of the deceased gentleman. 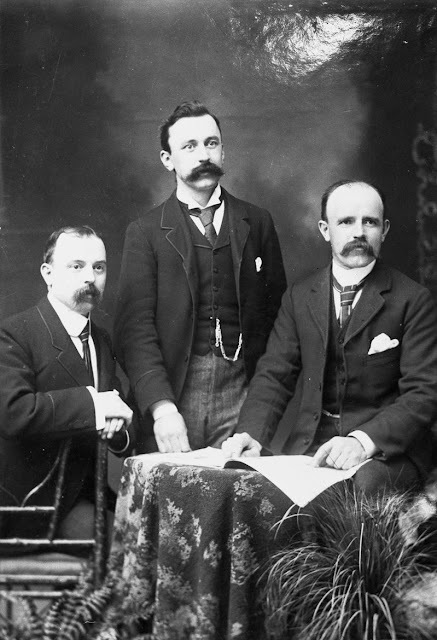 from left: Reginald Herbert Whalley, Ernest Richard Whalley and George Ethelbert Whalley. 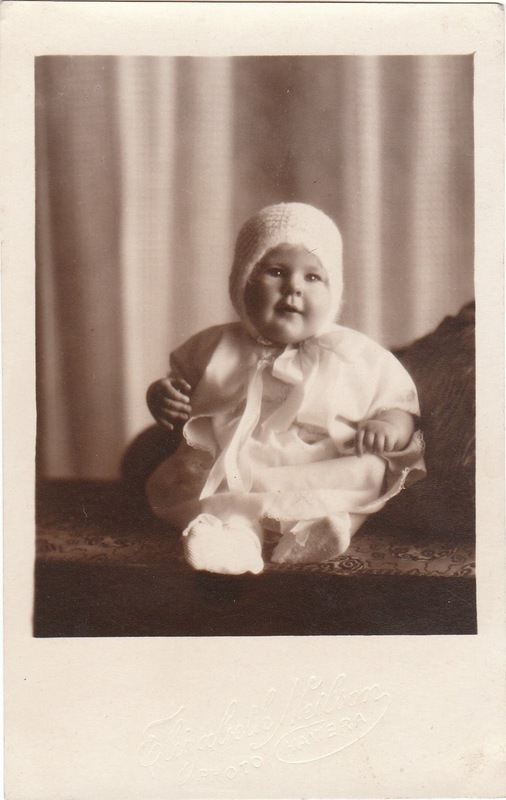 "England Births and Christenings, 1538-1975," database, FamilySearch (https://familysearch.org/ark:/61903/1:1:J7KF-L32 : 10 February 2018, Ernist Richard Walley, ); citing item 15, index based upon data collected by the Genealogical Society of Utah, Salt Lake City; FHL microfilm 1,595,425.